Read this nice piece by Carolina Perdigoto commenting on our recent Hi-C paper during Drosophila zygotic genome activation and the single-cell Hi-C in oocytes and early mouse embryos by the Tachibana-Konwalski laboratory. This entry was posted in News, Uncategorized on May 8, 2017 by admin. Read our latest work on the emergence of chromatin architecture during early development just out in Cell! This entry was posted in News on April 6, 2017 by admin. Read Juanma and Maria Elena‘s News&Views on four recent papers published in Nature examining the epigenomes of early stages of mammalian development. You can also listen to the Nature Podcast covering the four stories. This entry was posted in News on September 14, 2016 by admin. 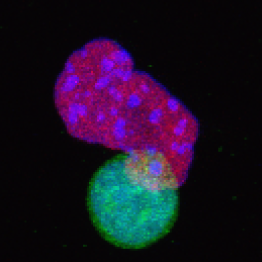 2-cell-like cell (green) displayed next to an embryonic stem cell (magenta). The first results of our collaboration with Maria Elena Torres-Padilla’s lab in Strasbourg see the light today in Nature Structural and Molecular Biology. In this manuscript, we show that the down-regulation of the histone chaperone CAF-1 in embryonic stem cells results in a dramatic increase of 2-cell-like cells in the culture. The resulting cells display many features of early embryonic totipotent cells, such as specific activation of 2-cell embryo gene expression programmes, up-regulation of repetitive elements, and an increased chromatin mobility. You can read the full details in the NSMB website and here. This entry was posted in News on August 3, 2015 by admin. Benjamin Hernandez joins the lab! Welcome to Benjamin, a last year student from the Licenciatura en Ciencias Genomicas. Benjamin joins after a research stint at the Zeitlinger lab and will be working on the formation of vasculature during development. We are looking for PhD students interested in working on computational analyses of chromatin regulation. The deadline for applications is on Sep 1 2014. For more information, please see PhD positions July 2014. This entry was posted in Jobs, News and tagged jobs, PhD student on July 22, 2014 by admin.